Soft Spot Table | OhGizmo! In my part of the world we actually refer to these things as benches but this probably could be passed off as a coffee table if needed. 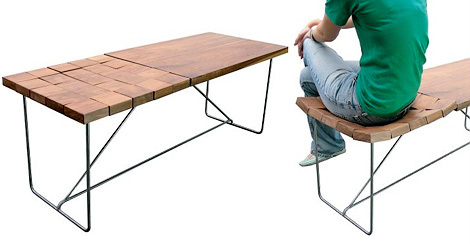 Either way the idea of making a wooden table that’s also a comfortable place to sit is intriguing. Designed by Stephen Reed the Soft Spot Table has an area composed of wood tiles that are all held together by elastic cords. The elastic has enough tension to make the tiles form a flat surface but also enough give to flex and cushion the area when someone is sitting on it. This is horrible, I am dissapionted in this design: the supporting legs are terribly ugly, this fails to look decarative, which is the main factor i look for in furniture!